Georgios Chortatsis, a contemporary of Shakespeare, was the greatest playwright of Venetian Crete. His works, noted for their originality of conception, psychological insight, tender lyricism, and genial or bawdy humour, demonstrate wide knowledge of the classics and Italian Cinquecento literature. Writing in a polished form of the Cretan dialect of modern Greek, he produced for the entertainment of upper-class audiences the pastoral comedy Panoria, the tragedy Erophile, and the urban comedy Katzarapos; the anonymous comedy Stathis, too, has been ascribed to him. Also included are fourteen interludes meant to accompany performances of these four plays, on chivalric and mythological themes suggested by T. Tasso and Ovid; at least nine of these are certainly by Chortatsis. 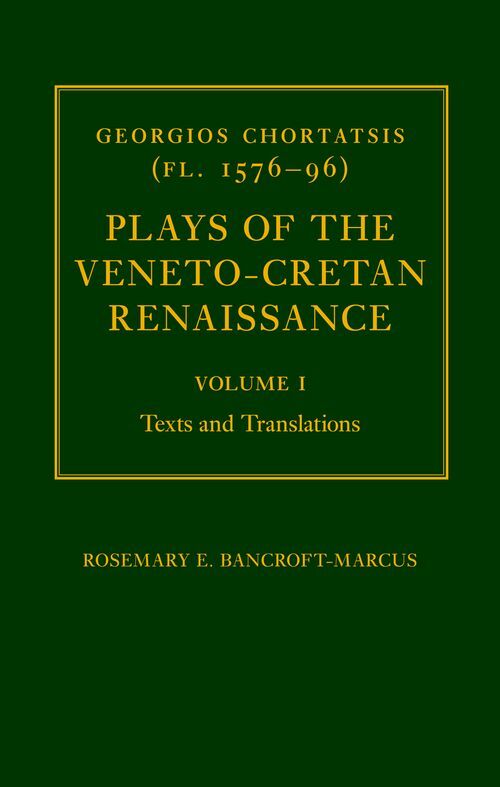 Rosemary Bancroft-Marcus, in the first volume of her bilingual Greek-English edition, provides the reading public with a unique compendious edition of all the plays and interludes traditionally ascribed to Chortatsis. New texts of the works, exhaustively revised from the extant textual witnesses, are presented with an innovative phonetically-based accent system designed to facilitate scansion of the fifteen-syllable rhyming couplets and the terza rima tragic chorus. The Greek texts are accompanied and elucidated by clear English translations, set Loeb-style in parallel against the Greek. The translation, in rhythmical English blank verse intended to be performable, attempts to convey the tone, dramatic impact, and stylistic effects of the original. The second and companion volume, under preparation for publication in 2014, will offer historical, literary, linguistic and editorial material in the form of a lengthy general Introduction, a Commentary on specific passages in the works, an Apparatus Criticus explaining the basis for the Greek texts in Volume I, an extensive Glossary, and a Bibliography. A new biographical identification of the playwright, connecting him with members of the Cretan Neoplatonic Academies, will be offered. Rosemary Bancroft-Marcus was originally a student of classics. She went from a BA in Latin with Greek at Exeter, via a year's study thanks to a British Council grant in Greece and Crete, to an Oxford D.Phil. in Medieval and Modern Languages. The present bilingual edition of Chortatsis evolved out of her doctoral thesis, Georgios Chortatsis, 16th-century Cretan playwright: a critical study (LMH, 1978). While following her physicist husband around the world, she has devoted herself to the study of the Veneto-Cretan Renaissance, speaking at international conferences, and writing articles and chapters for proceedings, journals, and collections of essays. She has previously taught a course on Cretan Renaissance literature at Geneva University and gave occasional lecture courses and tutorials for the modern Greek department at Oxford. She currently resides in Belgium where she continues to work on conference papers and editions of Veneto-Cretan poetic texts.